An integral part of maintaining a healthy lifestyle is balancing the soul, mind and the body. The coaches over at Bharat Thakur Artistic Yoga (BTA) use this mantra to motivate members, keeping in mind personal preference and physical ability. This encouragement and support provided by the coaches allow you to work towards a better version of yourself. The strenuous and challenging body movements lead to an increase in the body's flexibility. There are various programmes and classes offered for different requirements. Recently BTA completed their successful batch of SuperFAST Program, the results were phenomenal. Members who participated lost weight and inches, the highest was 51 inches and 22kgs in just 30 days! 1. What is Bharat Thakur's SuperFAST Program? SuperFAST is the latest offering by Bharat Thakur Artistic Yoga. It is a Fat Loss program that aims at giving you the best results within 30 days. 2. What do we give in Bharat Thakur's SuperFAST Program? 3. What do you get? 4. Who can do Bharat Thakur's SuperFAST Program? If you are already following a fitness routine, you too can get into this programme in order to fast forward your results. f you are a first timer at yoga, this programme will help you achieve a level of fitness which would otherwise take you much longer. If you are looking at rapid weight loss within a short span of time; whether for an all-important function or for any other occasion, SuperFAST is a concise and ideal way to lose the extra fat quickly. 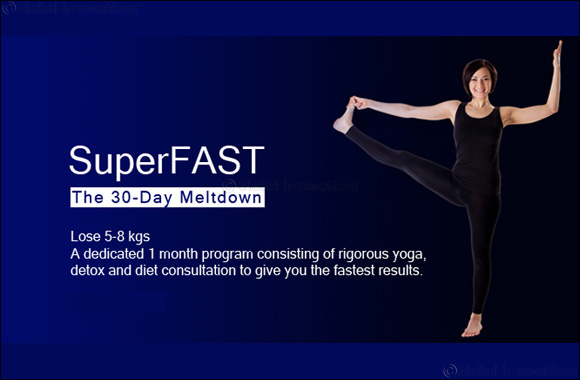 If you have been doing yoga and feel you are stuck somewhere (it's called hitting a plateau which happens in the course of any fitness regime), SuperFAST helps you break through. It's a programme which everyone can do from time to time to cleanse, detox and give their metabolism a nice shake-up. One such month once a year is essential to the system to reset itself. 5. What is unique about the SuperFAST program? The fact that it takes Just 30 days to deliver the kind of results that you would expect from a 6-month long regime. The short duration helps you stay focused, motivated and committed. The short duration also helps you push yourself the extra mile, to achieve fabulous fitness levels. The price is AED 700 Plus VAT for a 30-day program.